Do Tarantulas Exist In All Regions Of Texas? Are Any Species Dangerous? It is commonly assumed that tarantulas include all large-bodied spider species that possess tough bristly hairs. While this is generally the case, it would be more accurate to say that tarantulas are spider species that belong to the Theraphosidae family. This family is comprised of more than 800 species that are divided into 12 subfamilies. Around 30 tarantulas have been documented in the United States, nearly all of which belong to the sub-genus known as Aphonopelma. The state of Texas is home to 14 Aphonopelma species, but these spiders are relatively understudied, as they are not as ecologically or medically significant as numerous other arthropod species in the region. Tarantulas are distributed in nearly all regions of Texas, but south Texas sees the greatest amount of Tarantula activity. Tarantulas are numerous in desert and grassland regions of Texas, but during mating season, male tarantulas can be seen traveling in large groups through urban and suburban areas of the state. These male tarantulas travel far and wide in order to locate females that wait for their suitors within ground burrows. The Texas brown tarantula is the most abundant and commonly encountered species within the state. The leg-span of these tarantulas usually exceeds four inches and adults weigh around three ounces. Although many tarantula species burrow within uninhabited rural regions of Texas, it is not uncommon to find the arachnids dwelling within residential areas within the state. Not long ago, a family living in Missouri city discovered several brown tarantulas within their backyard, causing residents to become fearful of the hairy spiders. 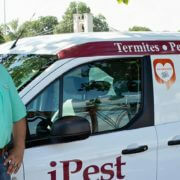 Luckily, brown tarantulas, as well as most other species in the south and southwest, are harmless to humans. Texas tarantulas fear humans, and will only inflict bites when threatened, but these bites result in pain sensations that are comparable to a bee sting. Tarantulas can also fling abdominal urticating hairs into people’s faces, causing irritation. However, these incidents only occur when the spiders are mishandled by humans. Tarantulas are often spotted in all of Texas’ large metropolitan areas, including Houston, Austin, San Antonio and Dallas. Have you ever sustained a bite from a wild tarantula species? 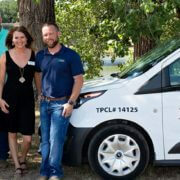 https://www.wacopest.com/wp-content/uploads/2018/08/0X2A5274.jpg 2400 3600 John https://www.wacopest.com/wp-content/uploads/2018/04/ipest-solutions-logo.png John2019-03-13 01:17:352019-03-12 17:39:32Do Tarantulas Exist In All Regions Of Texas? Are Any Species Dangerous? Texas is a big state that contains many different types of landscapes, and therefore, the state contains a great diversity of arthropod life. Although Texas is well known for its massive cockroach population, the state also contains at least 900 different spider species. while many Texas spiders may be big, hairy and frightening to look at, there does not exist any spider species within the state that are capable of inflicting medically significant bites to humans, with the exception of two species. Most people may feel inclined to assume that the most dangerous spiders in Texas are the giant tarantula species that can be found in the arid southwestern region of the state. But this is not the case, as the two spider species in the state that have been known to send people to the hospital are, not surprisingly, the brown recluse and the black widow. 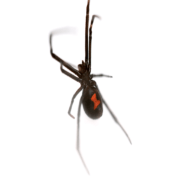 The black widow spider is well known for having a red hourglass design on its abdomen, but not everyone is aware that this design can only be found on female black widows, which, like most other spider species, are much larger in size than their male counterparts. 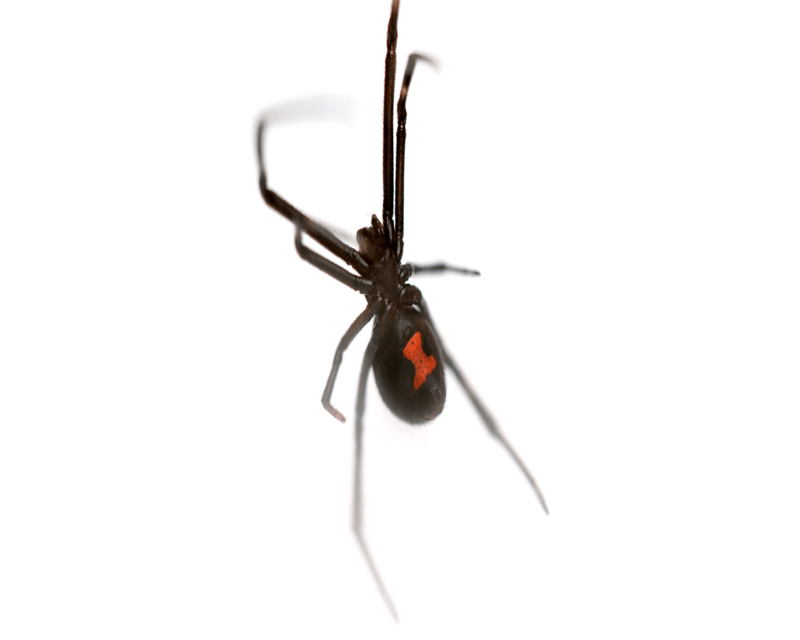 As a result of this body-size disparity, female black widows often consume their male mates, or do they? According to officials with the Houston Zoo, this form of cannibalism rarely occurs among black widows. Despite black widow spiders being the most venomous spider species in the United States, their bites usually do not pose a medical threat to healthy adults, but children, the elderly and the immunocompromised can fall ill or even die as a result of black widow envenomation. These spiders are typically found in dark and dry areas, such as garages, sheds and outhouses. The brown recluse is the most common of all brown spiders in the US, and they are often found within wood piles and even inside of homes. Although brown recluse spider habitats are only found within the south and south-central regions of the US, these spiders are great hitchhikers. This is due to their ability to survive long periods without sustenance, allowing them to survive within boxes and other items that are shipped to faraway regions. These spiders usually only bite when they feel threatened, and 90 percent of brown recluse bite wounds heal without scarring or medical intervention. Have you ever sustained a bite from a tarantula, a brown recluse or a black widow? Which Spider Species Are Most Often Found Within Produce Shipments? It is not necessarily uncommon for grocery store employees to find spiders within boxes of produce that were shipped from exotic locations. In some cases, the spiders found in this manner are highly venomous and pose a serious threat to the health of store employees. It is far more common for dock workers to encounter non-native and dangerous spiders while unloading produce shipments from trade vessels. Considering that spiders are abundant in areas of South America where agricultural products are sourced, it should not be surprising to learn that some spider species are found repeatedly within produce shipments arriving in America and Europe. Unfortunately, many spider species that are commonly found within produce shipments are highly venomous. The group of spiders commonly referred to as “armed spiders” are frequently found within shipments of fruit, particularly bananas. It is for this reason that residents of agrarian towns in South America refer to armed spiders as “banana bunch spiders”. These spiders inflict bites that cause tremendous pain to their victims. One study found that 96 percent of all armed spider bites caused intense pain. The venom produced by these spiders has been known to cause respiratory failure and death in people of all ages. It is also not uncommon to find Brazilian wandering spiders, black widow spiders and huntsman spiders infesting produce shipped from South America. Back in 2009, an employee at Whole Foods discovered a huntsman spider feeding on bananas within a box that had recently arrived to the store. In 2013, a black widow spider was found in a box of grapes within an Aldi store, and that same year, a British family was instructed by health authorities to leave their home immediately after a Brazilian wandering spider was found inside of a banana that had been purchased at a local supermarket. Although finding a giant hairy spider within a produce shipment can be alarming to say the least, a University of California archeologist, Richard Vetter, insists that most of the spider species found within produce shipments are harmless to humans. Have you ever found a spider within a grocery store? 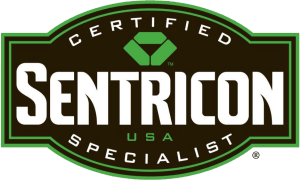 https://www.wacopest.com/wp-content/uploads/2018/04/ipest-solutions-logo.png 0 0 John https://www.wacopest.com/wp-content/uploads/2018/04/ipest-solutions-logo.png John2019-02-20 02:53:182019-02-19 17:39:40Which Spider Species Are Most Often Found Within Produce Shipments? Angry consumers have been signing a petition that is meant to prompt Petco officials into better educating their employees regarding proper tarantula care. The petition is also calling for Petco officials to revise and rewrite their tarantula care procedures in order to improve the living conditions of captive tarantulas within Petco stores. The primary goal of the petition is to convince Petco officials to upgrade their tarantula dwellings, as it has been alleged that the company’s tarantula enclosures cause the arachnids to die earlier than usual. Petco first came under fire for alleged tarantula abuse three years ago when authorities found that one of Petco’s suppliers kept tarantulas and other animals within deplorable warehouse conditions that resulted in many spider deaths. State authorities in Texas discovered the warehouse conditions after they served the owner of the pet supply company, US Global Exotics, with a search warrant. Authorities who rescued several tarantulas from the warehouse sustained venomous bites in the process, but no serious medical complications resulted. Now, the company is being accused of mistreating tarantulas by keeping specimens within enclosures that deprive the spiders of their basic necessities, which, consequently, results in their premature death. Have you ever noticed tarantulas being kept within inadequate enclosures in any pet store? There are plenty of videos online that show spiders and insects battling other spiders and insects. These videos fascinate many people who were not aware of the great physical strength possessed by some seemingly defenseless arthropod species. The most significant show of strength among arthropod species can be seen in videos that feature a spider or insect killing an animal of superior size. In some cases, the animals that are defeated and killed are not fellow arthropods; instead, they are reptiles, amphibians and even mammals. Not long ago, a video posted to Youtube captured the interest of people all over the world, as it showed an Australian huntsman spider fighting and killing a mouse. However, this video may not be so impressive, as experts say that the mouse featured in the video had already been dead. Misleading videos like this, and other videos that employ trickery to fool viewers into believing that spiders and insects can kill large animals, are all too common online. But, experts claim that numerous instances of seemingly unmatched battles between arthropods and larger sized animals have been documented. For example, a 2016 study from Brazil described an event in which a tarantula species, Grammostola quirogai, fought and killed a 15 inch Almaden snake before making a meal out of portions of the snake’s corpse. Another 2016 study from Germany described the first ever incident of dragonfly larvae eating fully grown adult frogs. Rare cases of dragonflies catching birds in midair before consuming them have also been documented. A large dragonfly species from Canada managed to catch a hummingbird while the two animals had been flying near each other. The only other known case of such an instance occurred in 1977. Fierce centipedes belonging to the aggressive Scolopendra family have been found consuming bats on numerous occasions. These centipedes have also been found consuming rats, lizards, frogs and even snakes, and not just any snake, but the extremely toxic Indian venom coral snake. The Polish cave beetle hunts and feeds on newts, and numerous spider species catch bats in their webs. These large prey animals provide spiders, insects and centipedes with a rich and long lasting source of nutrients. Have you ever found an arthropod consuming a non-arthropod species? Those who fear spiders may find it hard to believe that their fear is not shared with everyone else on the planet. After all, what is there to like about spiders? Spiders, are multi-eyed, multi-legged, sometimes hairy, fanged and often intimidating despite the expert claim that most spider species are ultimately harmless. Around 5 percent of the population suffers from arachnophobia, and statistically speaking, there exists no rational reason to fear spiders, as data suggests that a mere 100 human deaths occurred as a result of spider bites during the whole of the 20th century. While the majority of dangerous spiders have been well researched by scientists, there does exist some disagreement among experts concerning the potential dangers that hobo spiders pose to humans. Some experts say that past claims concerning this spider’s purported dangerousness to humans has been exaggerated, while others claim that this species, which exists here in the United States, can cause serious medical problems that could result in death in some cases. The hobo spider is a moderately large arachnid, as they typically grow to be around ¼ to ½ of an inch in length with a leg span of up to 2 full inches. Nobody knows for sure how the hobo spider arrived in North America, but experts believe that it was brought to the Seattle, Washington area from its native Europe at some point during the 1920s or 1930s. Since then, this spider species has spread across the Pacific Northwest. Many sources claim that hobo spiders can inflict bite wounds that can lead to tissue necrosis, but others say that such instances are exceptionally rare. What experts can agree on, however, is the unusually rapid speed in which these spiders can travel. Studies demonstrate the hobo spider as moving at 3 feet per second. 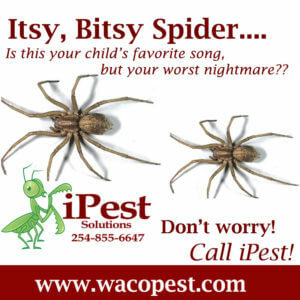 So if you encounter the hobo spider and live in the northwest US, you want to be in good physical shape if you hope to avoid its notorious bite. Have you ever encountered a hobo spider? Everyone can remember learning about mammals in preschool and early gradeschool. We were taught that only mammalian animals produce milk for the purposes of nourishing their offspring. While this is not exactly accurate due to the many non-mammalian lifeforms that also produce milk, it was good enough at the age of six. However, many people may be surprised to learn that a spider species has recently been discovered that produces its own nourishing fluid for its suckling spiderlings. This spider species is known as Toxeus magnus, and it is also notable for looking exactly like an ant in order to fool predators. The Toxeus magnus is a species of jumping spider that is native to southeast Asia. Female spiders of this species produce a fluid containing sugars, fats, and proteins in order to provide their babies with nourishment. The lead researcher investigating this new spider species, biologist Rui-Chang Quan of the Chinese Academy of Sciences, is referring to this fluid as “milk” for the time being, as such a substance has never been found before. Interestingly, researchers learned that the spiderlings continue feeding on their mother’s milk well into maturity, which is unusual. While spiders are not known for producing their own milk, a female spider’s parenting behavior is quite similar to mammalian parenting behaviors. Although many spider species are naturally solitary, many female spiders provide extended care for their offspring. For example, some female spiders avoid eating in order to constantly guard their egg cases, and other females will open their egg cases in order to give their spiderlings an occasional ride on their back. Other females even regurgitate food for their young, like birds do, but the recently discovered species of spider developed the ability to produce nourishing milk. Much like mammals, Toxeus magnus spiderlings are entirely dependent on their mother’s milk for survival. The researchers that found this spider species are convinced that many other spider species exist that also produce milk for their young, only they have yet to be discovered. Do you know of any insect species that produce milk for their offspring?